ISLAMABAD - 1 October 2018: UNICEF strongly condemns the attack on a primary school at Arandu village in the Khyber-Pakhtunkhwa province yesterday. The small building, located in the Chitral district near the border with Afghanistan, is said to have been partially destroyed by an improvised explosive device. No injuries were reported as the school was not open on Sunday. 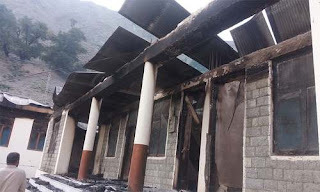 This latest attack comes less than two months after a dozen schools ─ most of them for girls ─ were ransacked and torched in Gilgit-Baltistan's Diamer district. “Every girl and boy has the right to education, everywhere. The destruction of schools has a devastating impact on the right to education and leaves long-term implications for the growth and healthy development of Pakistani children,” said UNICEF’s Pakistan Representative Aida Girma. “Schools must never be targeted, they must remain a place of safety and learning at all times,” she added.